Old horses and old saddles are nice to have around; they’re easy to ride, generally don’t cost much to acquire and previous owners have kindly put the time into breaking them in and mellowing them out. 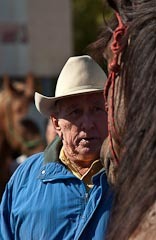 The senior resident on the ranch back in Florida is National Reining Horse Association Hall Of Fame inductee; ‘Mr. Feelin Good’. With the arrival of January 2011, he’s now 33. Although he’s still spunky when the mood strikes, he spends most of his time resting in the shade of his favorite oak tree with his best pal; a miniature donkey named “Dinky”. Throughout most of his seventeen year competitive career however, FG was a real pistol. Our paths crossed when he was nineteen and nearing retirement. I didn’t have a lot of money to spend; he was in need of a new home. It seems every aspect of horsemanship is about timing. For those of us who aren’t as knowledgeable as we’d like to be, timing may come in the form of a lucky break. In his younger days, (even if I could have afforded him then) FG would have been too much horse for me to handle safely. However, in his vintage condition, he was my ideal dancing partner. I only showed him for two seasons but I learned more in those two years than a lesser horse would have taught me in ten. After I retired FG from the show pen, I continued to ride him regularly for several more years and will always cherish the time we spent together. I feel fortunate that I was able to recognize the opportunity and be able to fully appreciate the fact that he was truly a great horse. Throughout my life with horses, I’ve come to understand the kind of horseman I am and what I can handle. This realization doesn’t need to take decades to discover, just the courage to be honest with yourself and the wisdom to know when to take a step back and when to take a chance. There is no aspect of horsemanship that will test a rider’s experience, feel, balance, timing, not to mention gastric fortitude, more than the fresh young untrained horse. Many consider riding colts to be the ultimate test of one’s ability- the true measure of horsemanship. What can you learn from riding colts? Plenty! To a person, the top clinicians working today built their careers training young horses. The knowledge gained and shared by such revered horseman as Ray Hunt and the Dorrance brothers was gleaned over decades of riding colts. 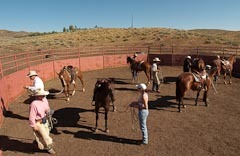 The foundation beneath the philosophy of natural horsemanship stems from starting colts. 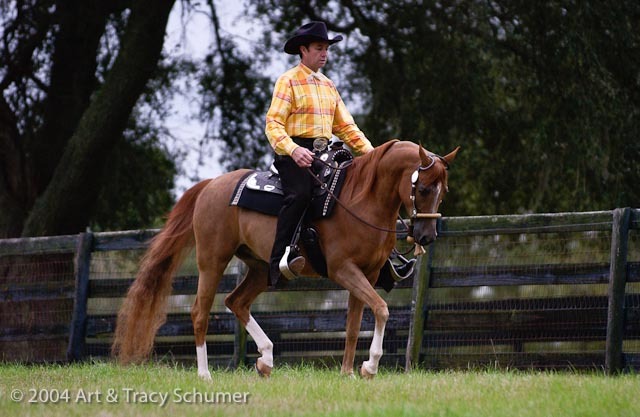 It’s interesting to note how much horsemanship has changed; even over the past decade. We used to say we were breaking horses to ride; now we are starting them. Colt riding is an art form unto itself. The accomplished colt rider is a supremely self assured horseman who is at all times prepared for whatever may come next no matter how quickly the situation may take place. “Colt’s don’t rattle me at all,” A seasoned cowhand once told me, “I can ride as fast as they can run.” This technique can be highly effective when horse and rider have the room to run but most of us don’t live on the open range. The advice of experts must be measured against our own working conditions and limits of space. Over the years it’s been my privilege to observe a large number of excellent colt riders in action; both professionals as well as highly skilled amateurs. When all the elements fold together cleanly, it’s truly inspiring. Sadly, I’ve also watched in horror as nice folks get themselves hurt trying to ride a colt that’s too much for them. For the dedicated recreational horseman of intermediate skill, who has a good natured young horse, attending a colt starting clinic can be a highly rewarding, fun and exciting experience. This is a self confident rider, in good physical condition who has put a lot of time into preparing themselves to deal with any situation that may occur while working with their colt; both on the ground and in the saddle. Knowing all the while, that it’s when the clinic ends that the real work begins. Truth is, colt riding is not for everyone and no rider should ever feel pressured to ride colts in order to ‘prove themselves’. These days the pressure is even greater with the advent of colt starting as a competitive sport but the drive to ride young stock needs to come from within not from outward desires to fit in or be fashionable. Ultimately, you have nobody to satisfy but yourself. Colt riding demands a high level of personal dedication and when done correctly, which is to say, to the benefit of the horse, the personal rewards are better than any trophy. The question to honestly ask yourself is; do I have the time and skill to train my own horse? The young horse needs all the time, miles, patience and attention his trainer can give. Most recreational horseman are riders not trainers. It’s important to note that, when it comes to colt starting clinics, you don’t have to be down in the arena to share in the thrill of the action. It can be just as enjoyable and rewarding to watch from the safety of the bleachers as a trusted professional starts your special baby. A good quality, well trained saddle horse is a joy be around and especially to ride. I like to think of myself as a connoisseur of the well trained horse. Some folks believe that a preference for riding expertly trained horses limits a person’s ability to improve but I disagree; I’m not a trainer after all I like to ride. One of the best ways to refine horsemanship is to ride lots of different horses and the better trained they are, the more you’ll learn. Knowing what is truly correct in a movement is only possible if you know what correct actually feels like. Taking advantage of lesson opportunities at professional stables with good school master horses is a great way to gain experience. 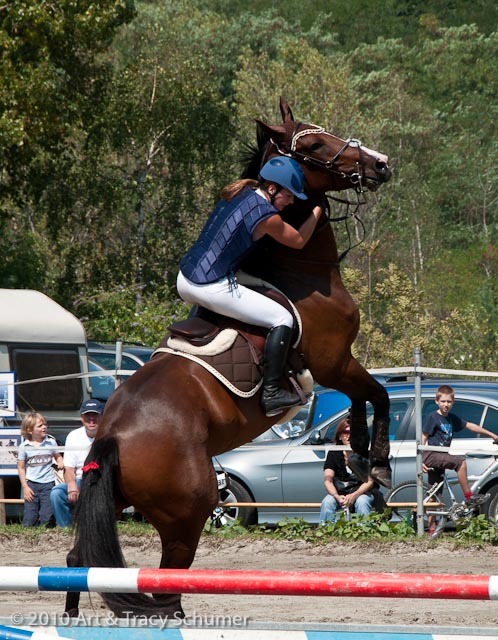 For the novice rider especially, a well trained, good natured horse is the ideal companion. The value is not only in the horse’s calm demeanor but in his ability to “fill in” whenever his rider needs him too. Most of the time the novice rider won’t realize his horse is on autopilot but as the rider’s skills improve, the horse will need to fill in for him less and less until one day the novice becomes a horseman. 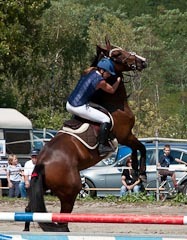 The more advanced the level of training in the horse, however, the more advanced the rider needs to be. There are few things more disappointing to the professional than to send out a fine quality horse that he’s spent several months, or even years, developing with suppleness and a soft feel only to have him come back soured with a hard mouth and stiff sides. Horses aren’t like people; they don’t have the ability to lie. The truth will always come through in the way the horse rides and behaves. One of the most potentially ego damaging aspects of horsemanship is the horse’s natural tendency to reflect his rider’s shortcomings. That same tendency, however, will show brightly when the rider gets it right. It’s the goal of every good horseman to build their knowledge and skills. Even in the twilight of his life, clinician Ray Hunt considered himself a student of the horse; always learning. Ask any top professional traveling the clinic circuit today if they think they will ever reach a point in their life when they truly know everything there is to know about the horse and horsemanship and to a person they’ll say no. Part of the enjoyment of being good at something is the belief that you can be even better. Clinician Tom Curtin once told me that if he ever reached the point where he knew it all, he knew death would soon follow. In other words, with no more opportunities to learn his reason for living would leave him. Every rider is an individual and every horse is an individual so the combinations, situations, actions and reactions they’re capable of producing are endless. Just when you think you’ve seen it all, something pops up that is totally off the chart. The good horseman sees each new experience as an opportunity to become just that much better. Often it’s the unexpected situations that we learn from the most. When an unexpected outcome turns out to be the best possible one, it may have been luck on your side but if you learn from that experience, it won’t be next time. Even the smallest, most mundane activities are an opportunity to refine one’s skill. Over time these small details add up and the little things we paid attention too pay us back with interest when something big happens. An aspect of knowing yourself as a horseman is thinking about what you’re doing when your doing it so you can learn from your mistakes but most importantly so you can remember what it felt like to get it right. I’m constantly reminded of horseman Tom Dorrance and his often repeated little tongue twister: “Know what happens before it happens so when it happens you know what happened”. Anyone who has ever attended a clinic or taken a lesson has probably heard the instructor make this statement but few understand it’s importance; “know your limitations”- its a sign of experience and it’s that experience that will tell you when you can safely test your limitations in order to push ahead to the next level. Personal limitations are never static in the learning horseman; they’re always changing. They expand and contract depending on particular points in our lives such as our level of activity, health, age and the horses we happen to be riding at any given time. We’d all like to think that if we work hard enough, attend enough clinics, take enough private lessons, that someday we’ll be just like our heros but is that truly what we want? Very few of us have the talent, time or the willingness to make the sacrifices that go along with ‘being the best’. What we all have inside us is the ability to be the best horsemen we’re capable of being and that’s pretty cool when you think about it. In this context, our goals become a personal choice rather than a standard applied by someone else. We’re living in a fascinating time and economic woes aside, this is truly a golden era for horsemanship.The latest information is at our fingertips; just a few key-strokes away. The best horseman of our day are in fact, some of the best who have ever lived. Their home base may be on the other side of the country or even on another continent but their website clinic schedule says they’ll be coming to your area. Make an investment in yourself, attend a clinic at least once a year or better yet, choose a favorite to ride in and audit as many of the others as you can. Don’t limit yourself to the clinicians within your own discipline- branch out, an open mind learns best. Remember, this is a class that you’ve paid for, bring a notepad, your camera, some snacks, but don’t bring that friend of yours who just wants to talk about her latest boyfriend the whole time! After the clinic is over remember your local trainer is more skilled and more educated than he or she’s ever been so take advantage of the opportunity and take a lesson. HMH: Are Clinicians Great Horseman? 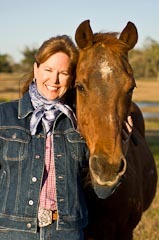 Comments for "Knowing The Horseman Inside Yourself"
Denise on February 13, 2011 Nice summary and reminder to all readers.